Protection of Endangered Species is being brought to a whole new level in South Africa. 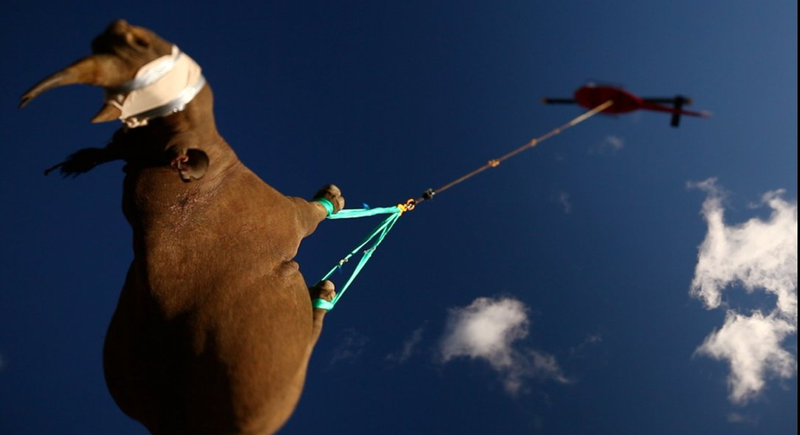 The Black Rhino Range Expansion Project is successfully transferring Black Rhinos from their natural habitat to a safer location OVER 1,500 km away. Apparently there is a horrible poaching problem in South Africa and Vietnam regarding myths that Rhino horns contain the cure for cancer. So in order to protect this endangered species they are resorting to new measures that are safer and quicker for everyone involved. (Rhinos included). Maybe it’s just me, but I don’t see anything like this ever happening around here. While I would personally love seeing animals flying over my house, (Who wouldn’t love to look up and see a Canada Lynx flying 200 feet up?) , I think there are to many rules and regulations to allow something like this. Obviously there aren’t to many animals around of this size and magnitude, but I feel like if were to happen it would have to be a little more discrete. I’m not sure I agree, there is a folk legend for uses of human horn on Omicron Persei 8, and this is setting a precedent for the taking of humans by spaceship. Wow! That looks very uncomfortable!